I’m not sure I have the vocabulary to describe how much I loved this drink. If you are anything like me, and counted down until the day Starbucks began serving their Pumpkin Spice Latte (Sept 1, in case you were wondering); and you like a good cocktail, YOU.WILL.LOVE.THIS.DRINK. It was a Friday night, and I felt like making a nice cocktail. I opened up my liquor cabinet and the first thing that caught my eye was the vanilla vodka. I began to scour the cabinets for what to mix with it. To the left was pumpkin liqueur I had used on pumpkin martinis last year (good, but not great), and hidden in the back was Starbucks Cream Liqueur. Like all great ideas, this one hit me in an instant, and my mind quickly formed this drink. I just knew I had to make it. I love “concocting” cocktails, so I just guessed at how much of each ingredient I needed to make a drink to my liking. I’m a girl that can handle, and actually welcome the taste of alcohol. I don’t want a drink that’s straight up alcohol, but I don’t want a sugary sweet mess. I think this drink really draws the line right in the middle of the road, and would appeal to most adult tastes. (Yes, ADULT. Kids, don’t drink till you’re 21.) You could easily adjust the recipe by adding more milk and/or less vodka if you find it too strong. My trusted martini shaker looks just like this one. I used the cap to measure my ingredients. 1 capful equals “1 part”. This is the easiest way to make them, in my opinion, because if you want to make a double batch of something, or more, it makes for easy conversion. When I took my first sip, my tastebuds were quickly met with the exact flavor I was hoping for. It literally tasted like a Starbucks Pumpkin Spice Latte, but with alcohol. To me, that is a very, very good thing! It was creamy, & smooth, with the signature pumpkin flavor, spice, and even color. Wow… my mouth is watering just thinking about it again. **2011 Update** They may have stopped producing the Starbucks Cream Liqueur, so any coffee cream liqueur will do, such as Kahlua, etc. 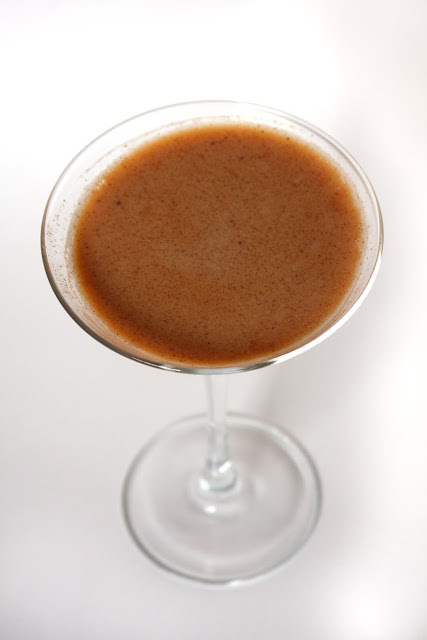 Combine all ingredients except pumpkin pie spice in martini shaker over ice. Shake well and strain into martini glass. Sprinkle with Pumpkin Pie Spice. Serve immediately & enjoy. You are like Sandra Lee with her "now it's cocktail time"!!! I bet this was delicious! Oh me. Oh my. Now I know why I like you so much! This looks fabulous – I want one now! 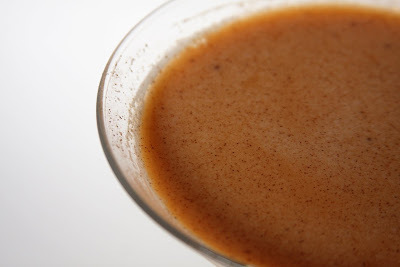 This looks awesome… perfect for maximizing pumpkin spice goodness at all hours of the day! Drunken Fall, I love it! Erin, I Puffy Heart You! This looks delicious! YUM! I'm a pumpkin junkie too! Where oh where did you ever find pumpkin liqueur? This is the perfect time of year to start looking for it! omg. i'm trying this tonight! I LOVE this and just saved the recipe! I hope I can find pumpkin liqueur to make it! Wow, does this ever sound good! I'll have to hunt for pumpkin liquer!! Looks so yummy! I'm not really a cocktail drinker but this might sway me. Looks perfect for a fall cocktail part. Oh yum! I am loving anything pumpkin right now and this cocktail sounds delish! Pingback: Design Crush » Caramel + Chocolate Dipped Apples. What brand of pumpkin liquer did you use? The only thing I could find was neon orange and tasted very artificial. The color looked nothing like the picture and it didn’t taste like much. I used the Bols brand, and it is neon orange. As seen here. Because it counts up for less than 1/4 of the recipe, the color & flavor are very muted. I’ve actually had the same bottle of pumpkin liqueur for a few years now, because the recipe requires just a little bit. In this martini recipe, as in many, all the different flavors really combined to give a distinct flavor separate from the individual flavors, if that makes sense. You could try to make your own pumpkin liqueur, as seen here! Good luck! 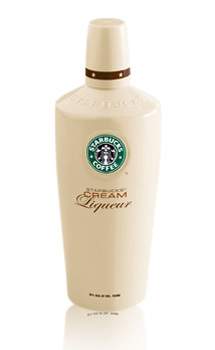 In fact, the harder product to find would be the Starbucks liqueurs. It’s my understanding they don’t make them anymore! 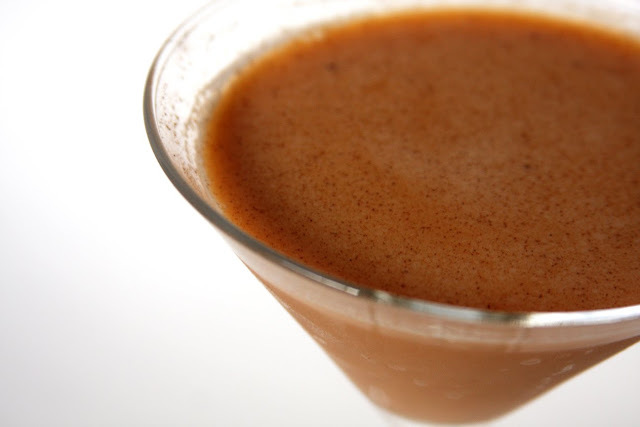 Here’s a good list of other coffee liqueurs, and other cream liqueurs. Oh my goodness. This sounds wonderful. I to count the days to pumpkin latte’s. Do you buy the Starbucks Cream at any Starbucks? Actually no, it’s only available at liquor stores, and I think I heard they stopped making it. Check out my previous reply to the comment above yours, and you can see a link to other cream liquors that work. Hiram Walker makes a non cream based pumpkin spice liquer which is also neon in color and nearly impossible to find in my area. 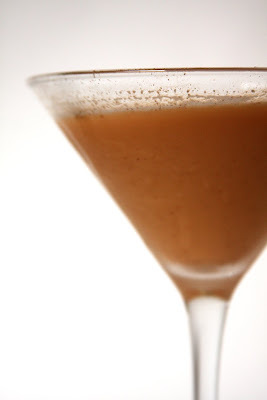 I have made this twice now and the first I substituted Kahlua for the Starbucks liquer. This time, not being able to find the pumpkin spice liquer, I used Pumpkin Spice Kahlua and I am happy with the results! Cheers!